Personalized Sports Water Bottles Custom Printed in Bulk. Promotional, Very Inexpensive. Budget Prices in USA and Canada . Wholesale sports bottles personalized in bulk, at clearance prices. 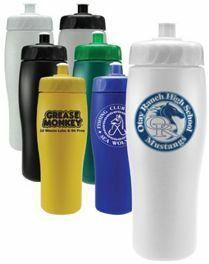 Our bulk personalized sports bottles come with either push-pull lids or flex straws: please specify, they have the same price! Budget Prices in USA and Canada for wholesale sports bottles. American clients pay no taxes. Free imprint on both sides or wrap-around. Free artwork design. We will send you a proof for your approval before production. Please check also our mood sports bottles and our translucent sports bottles . 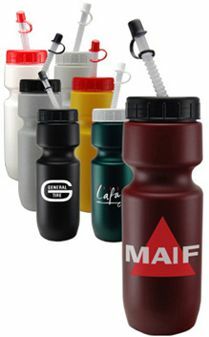 Bulk personalized colored sports or bike bottles, USA Made and FDA approved. 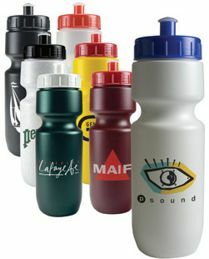 We supply four styles of personalized sports bottles: see photos. All 4 styles have the same price. Free imprint on both sides or wrap-around. Size: K0301, K0391: 22 Oz. ; K0373, K0374: 24 Oz. (Other sizes are available: contact us). • Push Pull Lid or Flex Straw: same price. Colors: White, Granite Gray, Frosted Clear, Black, Yellow, Blue, Burgundy, Hunter Green with your choice of White Lid, Black Lid, Red Lid, Blue Lid, Translucent Red Lid, Translucent Blue Lid, Translucent Green Lid. Imprint area: 3"x2-1/8" per side or 8"x2-1/8"
Safety Statement: all our sports bottles are USA made and the materials are FDA approved for food packaging and food contact. All bottles are BPA free. Recommended to minimize scuffing - add $0.05 per sports bottle. Prices below include your 1-color custom imprint on both sides or wrap-around, or they are for blank (not custom imprinted) sports bottles. The price is the same for all the styles of sports bottle.